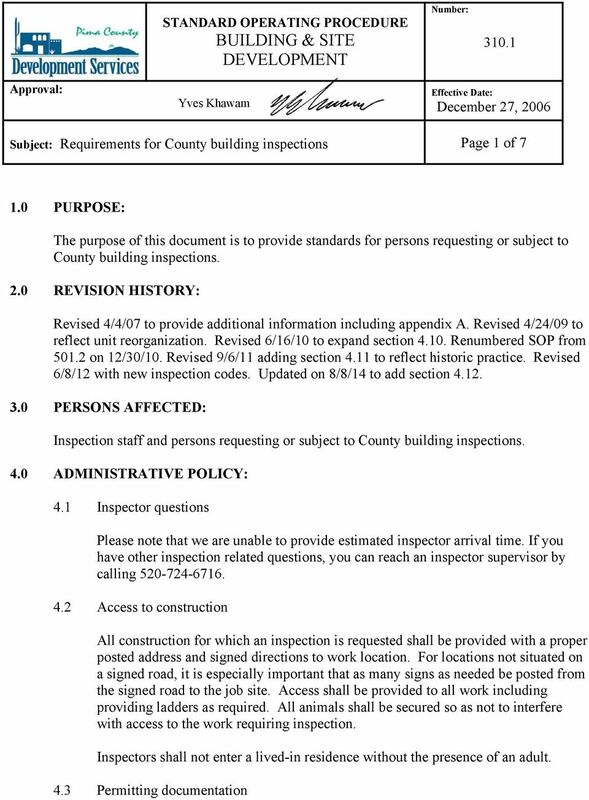 Download "The purpose of this document is to provide standards for persons requesting or subject to County building inspections." 2 CONTINUATION SHEET Number: Page 2 of 7 Required permitting documentation shall consist of permit and conditions sheet, approved bound plans containing no other markings, a folder containing inspection history arranged in chronological order, and any supporting construction documentation including evaluation reports, manufacture specifications and approved truss drawings with layout sheet. Documentation for single family dwellings shall be located as follows for intermediate inspections: water heater platform, fireplace, or entrance to dwelling from garage or carport. For final inspections, documentation shall be located on the kitchen countertop or at the entrance to dwelling from the garage or carport. If documentation is placed in a tube, the tube shall be minimum 3 diameter and large enough to allow the easy removal and reinserting of all documentation. 4.4 Permit conditions Project specific special conditions are listed on the permit documents. These need to be read by the contractor prior to start of construction. 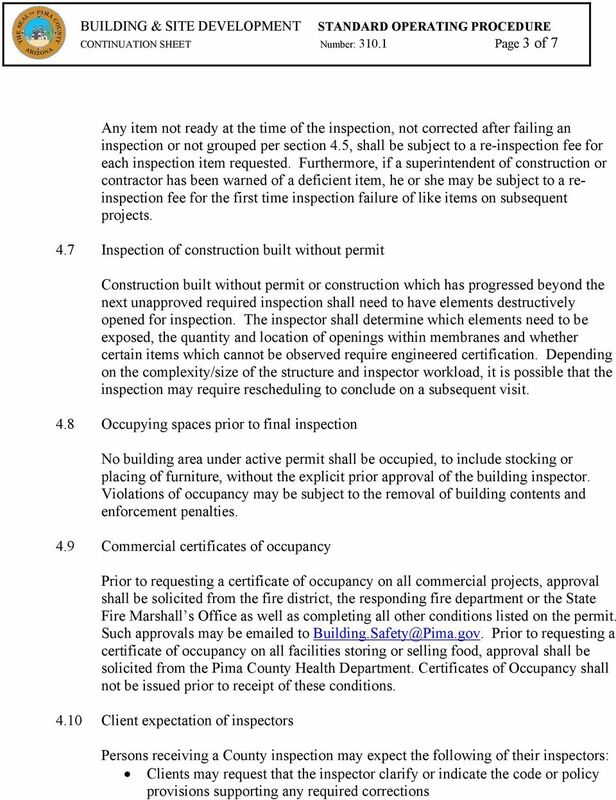 4.5 Partial inspections Building permit fees are in part based on the number of inspections listed on the permit card. Hence the standard permit fee does not cover partial inspections for single family dwellings smaller than 5000 square feet. However, should a client desire partial inspections, these can be accommodated with payment of a reinspection fee for each additional requested visit in order to cover our cost. Every attempt shall be made to group the temporary power inspection with another inspection. 4.6 Re-inspection fees We wish to help you succeed in building safe and sustainable structures through providing efficient and effective inspections. In that regard, your inspector is a valuable resource from whom you may solicit information and guidance throughout the process. However, in order to provide our services, we need to ensure that no inspection is called in prior to being ready. Please verify that all prior approvals have been obtained, that all pertaining conditions have been met and that all work is ready prior to calling for an inspection. Inspections which cannot be located for lack of a posted address shall be subject to a re-inspection fee. 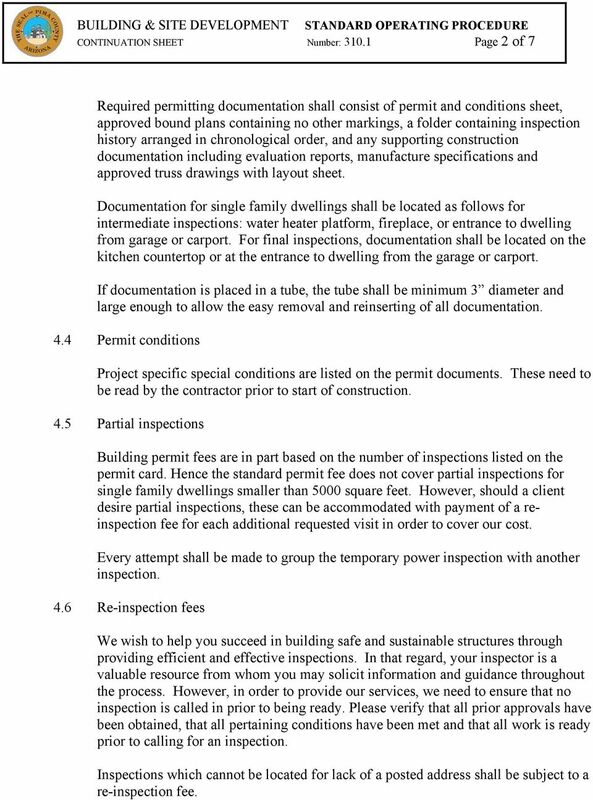 5 CONTINUATION SHEET Number: Page 5 of 7 Typical Residential Inspection Listing and Cursory Requirements 1. 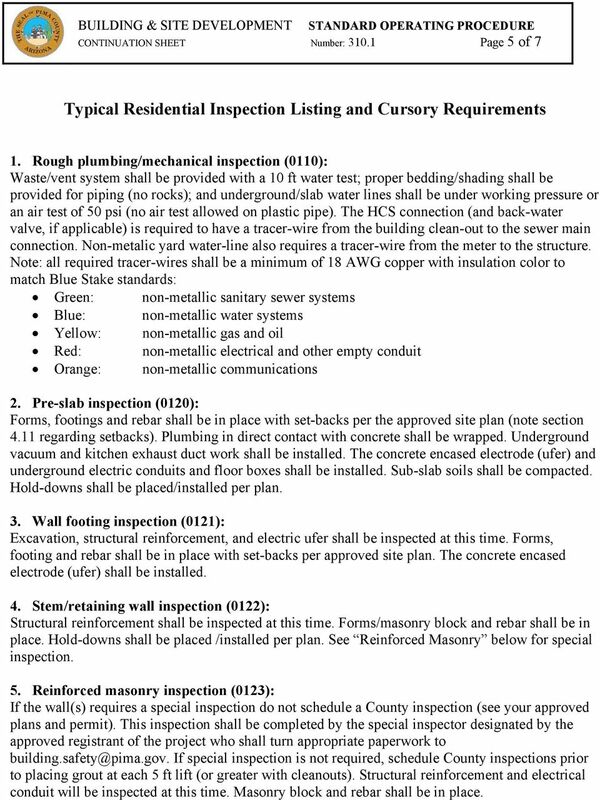 Rough plumbing/mechanical inspection (0110): Waste/vent system shall be provided with a 10 ft water test; proper bedding/shading shall be provided for piping (no rocks); and underground/slab water lines shall be under working pressure or an air test of 50 psi (no air test allowed on plastic pipe). The HCS connection (and back-water valve, if applicable) is required to have a tracer-wire from the building clean-out to the sewer main connection. Non-metalic yard water-line also requires a tracer-wire from the meter to the structure. Note: all required tracer-wires shall be a minimum of 18 AWG copper with insulation color to match Blue Stake standards: Green: non-metallic sanitary sewer systems Blue: non-metallic water systems Yellow: non-metallic gas and oil Red: non-metallic electrical and other empty conduit Orange: non-metallic communications 2. Pre-slab inspection (0120): Forms, footings and rebar shall be in place with set-backs per the approved site plan (note section 4.11 regarding setbacks). Plumbing in direct contact with concrete shall be wrapped. Underground vacuum and kitchen exhaust duct work shall be installed. The concrete encased electrode (ufer) and underground electric conduits and floor boxes shall be installed. Sub-slab soils shall be compacted. Hold-downs shall be placed/installed per plan. 3. Wall footing inspection (0121): Excavation, structural reinforcement, and electric ufer shall be inspected at this time. Forms, footing and rebar shall be in place with set-backs per approved site plan. The concrete encased electrode (ufer) shall be installed. 4. Stem/retaining wall inspection (0122): Structural reinforcement shall be inspected at this time. Forms/masonry block and rebar shall be in place. Hold-downs shall be placed /installed per plan. See Reinforced Masonry below for special inspection. 5. Reinforced masonry inspection (0123): If the wall(s) requires a special inspection do not schedule a County inspection (see your approved plans and permit). This inspection shall be completed by the special inspector designated by the approved registrant of the project who shall turn appropriate paperwork to If special inspection is not required, schedule County inspections prior to placing grout at each 5 ft lift (or greater with cleanouts). Structural reinforcement and electrical conduit will be inspected at this time. Masonry block and rebar shall be in place. 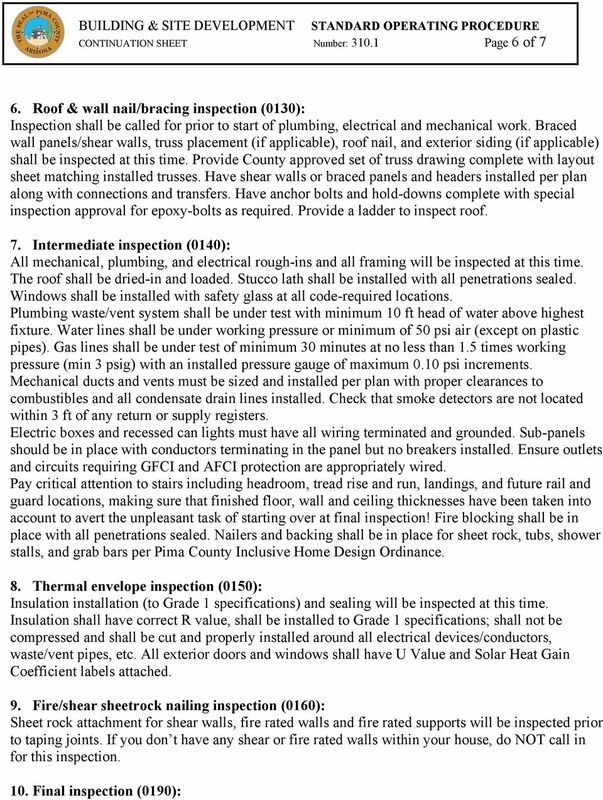 7 CONTINUATION SHEET Number: Page 7 of 7 Plumbing, mechanical, electrical, outdoor lighting and building final inspections shall take place at this time. Submit to any special inspection reports and documents per the Special Conditions listed on your permit prior to attempting to schedule final inspections. The entire building needs to be complete (including all bathrooms)! Install and label circuit breakers and test all systems. Provide manufacturer installation specs for all appliances including furnace, AC unit, and water heater. Check that exterior grades slope away from the building for drainage and that exterior doors are provided with landings. Paint any exterior ABS or PVC piping. 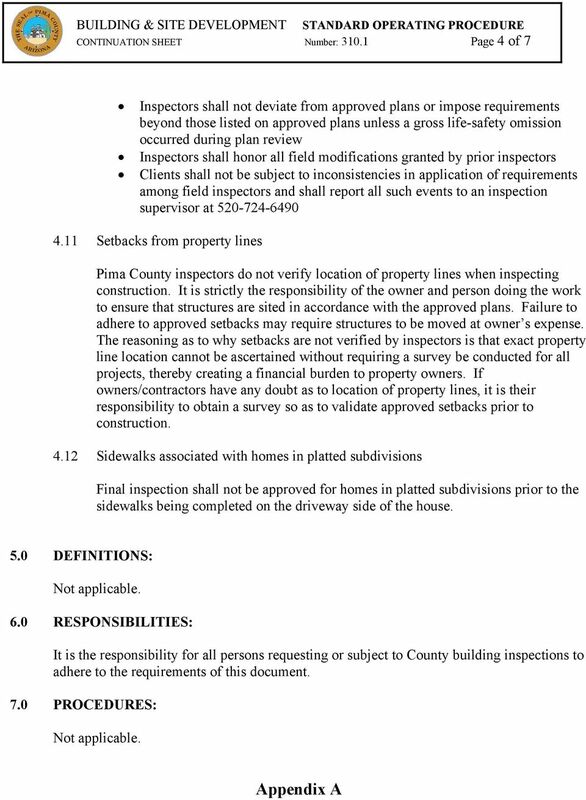 PARK COUNTY BUILDING PERMIT GUIDE PO Box 517 Fairplay, CO 80440 719-836-4255 Fax: 719-836-4268 Inspections: 719-836-4257 www.parkco.